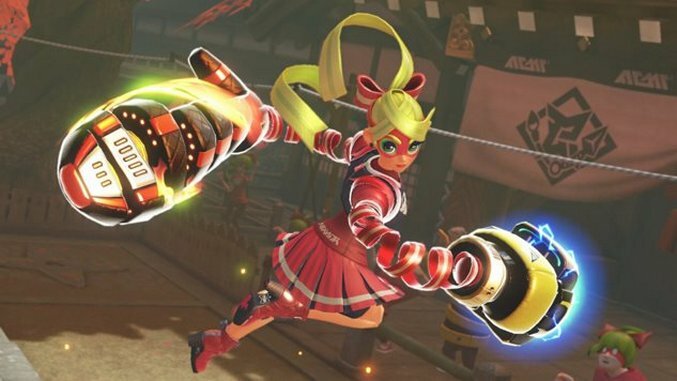 Nintendo’s Arms is a game about punching opponents with cartoonish, springy appendages where regular, non-extendable arms would normally go. In it, neon emblazoned characters duke it out on a series of brightly lit stages for the honor of winning the Grand Prix. And that’s it… unless you dig a little deeper. 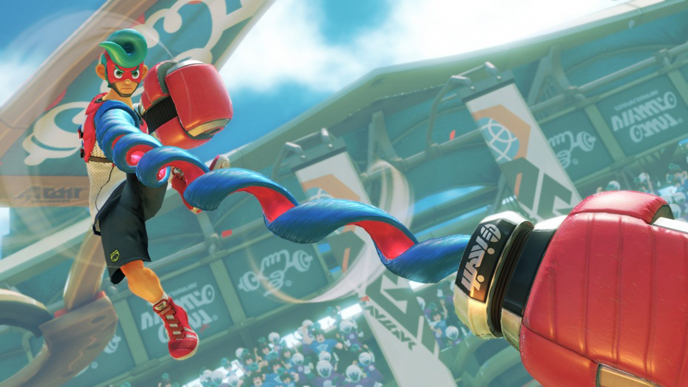 As much as it sells itself as a simple, unnuanced experience where you get to punch the air with friends, Arms is also a game that delivers us the Kafka-esque scenario of waking up with a transformed pair of limbs and deciding then and there to fight on television for fame and money (canonic lore according to a Game Informer interview with the game’s producer and art director). The inherent strangeness of this conceit inspires some additional questions about Arms’ hidden lore and the kind of fictional world it suggests. 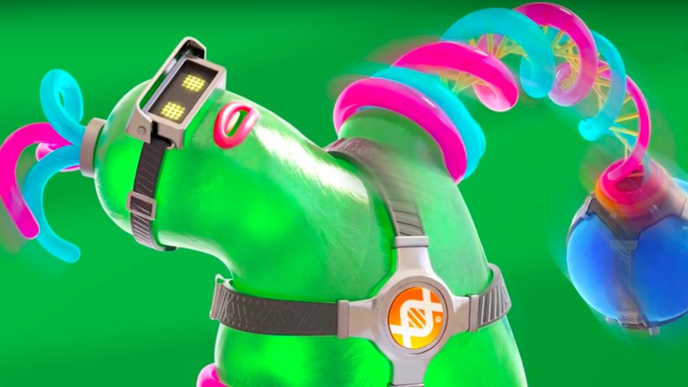 Why is the ARMS Laboratory engineering clones like Helix to compete in the ARMS League? It doesn’t really make sense that a tournament built around a small roster of memorable fighters with their own unique stories would seek to upset that balance by flooding the market with cookie-cutter clones of Helix. While there is a game mode, 1 vs 100, in which you must survive against waves of clones, it’s difficult to believe that this one solitary, spin-off activity is enough reason to invest so much time and money into cloning. Remember the Star Wars prequels (try, as we might, to forget)? A clone army might be the true end goal for a big mysterious organization like the ARMS League. The question still remains: to what end? Does this have anything to do with how people are magically waking up with extendable arms? This theory is, perhaps, a little out of left field, but what if people waking up with springs for arms wasn’t an accident? Like the dream specialists in Eternal Sunshine of The Spotless Mind, maybe operatives from ARMS Laboratories, in partnership with the league, are sneaking into people’s homes while they sleep and swapping out their limbs mid-slumber. Upon waking, the victims are forced to decided whether to adapt these wild contraptions to their old lives… or to sign up for the one activity their new appendages just conveniently happen to be perfect for. Is there like a Harry Potter “mudblood” phenomenon where fighters who were born with arms look down on those who merely woke up with them? There’s been a good deal of discussion about how videogames (and books, and movies) love to create their own form of fantasy prejudice that makes a certain set of characters seem even more evil (while ignoring real life racism, of course). 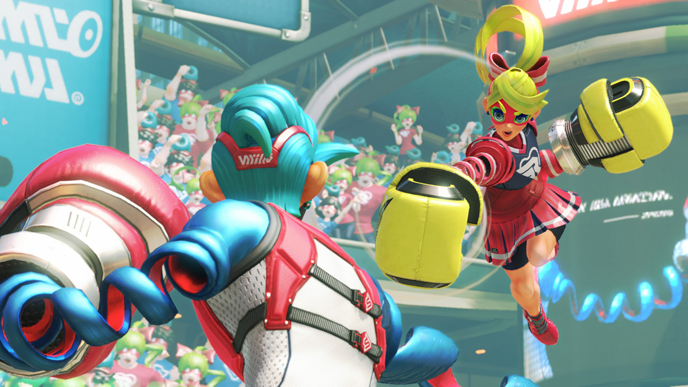 Arms probably won’t get into that, considering the family-focused nature of Nintendo’s brand but I bet some of the Arms characters who’ve always had extendable arms think the fighters who only acquired them recently are poseurs. Prime suspect? Ninjara. First off, he literally goes to an elite Ninja University. Second, the Ninja College stage he fights on features ancient statues with extendable arms. So clearly, there’s a certain amount of lineage and pedigree puffing up his worldview. 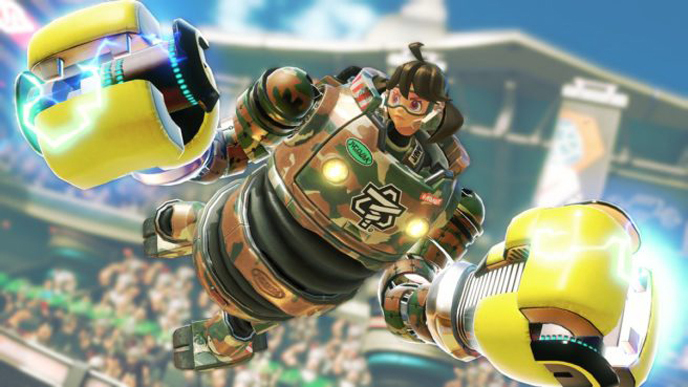 Mechanica is the one fighter in the ARMS League who doesn’t have extendable arms. She gets around this seemingly stringent requirement for entry by fighting within a large, spring-armed mechasuit. But considering the obviousness of her deceit, why do the tournament organizers allow her to compete? Perhaps she’s helping them in some other way, which leads me to my next question. Who built Byte & Barq? Byte & Barq’s unknown provenance leads me to make a dramatic accusation: they are part of an alternative experiment led by the ARMS Lab (and aided by Mechanica) to create a robot army in case the Helix cloning project doesn’t work out. 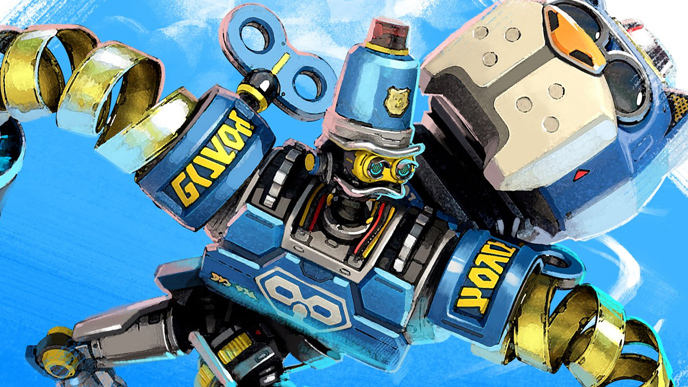 We may not have any evidence for this but I do find the idea that the only robots in this world (unless you count Headlok) were previously being wasted on a job like Beach Patrol (no offense meant for any beach officers reading this). 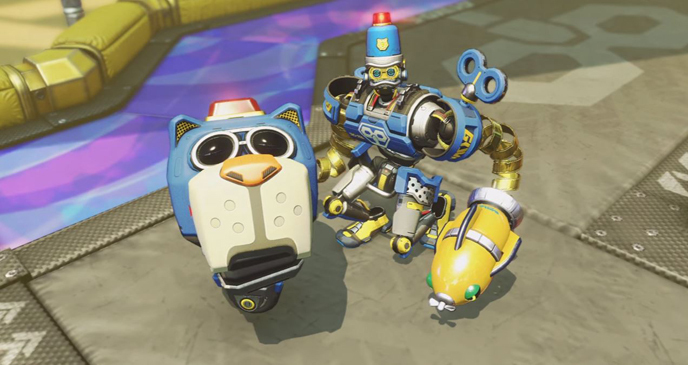 Does Barq have the same level of consciousness as Byte and if so does he resent being put into a small dog head body? Playing with Byte & Barq, I can tell that their love is real. They’re partners, through and through. But physically speaking, one partner seems to have gotten the short end of the robot engineering stick: Barq. Since they’re robots and powered by artificial intelligence, why would their makers choose give one of them the intellect of a dog? Instead, I imagine Barq is every bit as intelligent and self-aware as Byte. But this means that while one is controlled by the player, has extendable arms and is the clear hero, the other is a glorified diving board -a one-wheeled punching bag. Truly, this is the most unjust of all my head-canon dramas. What’s the deal with Hedlok? Is he a robot? Is he an alien? 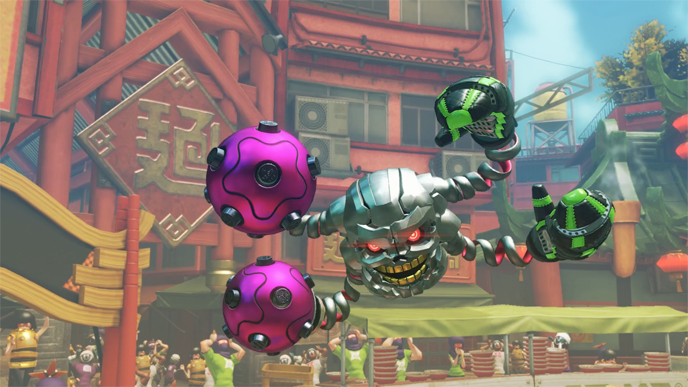 Hedlok is truly one of the most confounding characters in the game, and I look forward to learning more about him if/when he becomes a playable fighter. All I can say for now is that the manner in which he steals control over other fighters aligns neatly with my theory about the ARMS Laboratory’s nefarious arm-swapping, army building intentions. There’s something shadowy going on, and it wouldn’t surprise me if Hedlok were at the center of it. Either he’s another experiment, escaped from the same labs that are now churning out Helixes, or he is actually in charge. After all, he’s always somewhere up there in the stratosphere, swooping down to test your fighter and make you earn that Grand Prix medal. Max Brass is tough, but he doesn’t honestly seem smart enough to run the ARMS League. Perhaps he’s being puppeted by Hedlok in more ways than one. Yussef Cole is a writer and visual artist from the Bronx, NY. His specialty is graphic design for television but he also deeply enjoys thinking and writing about games.